I must admit: I'm not really excited about Valentines Day. Ever. To me, Valentines is just the first and second week of February where chocolate is cheaper than usual (win) and when Lush launches an amazing new range of goodies (win). Lush always manages to create the most amazing products for every single occasion, especially Christmas (my favourite collection) and Valentines. Their Valentines collection always smells like flowers and roses and are amazingly photogenic and cute to decorate your bathroom with. Now I must admit, I'm not the biggest rose-scent loving person out there, but these pieces aren't too overwhelming. They smell quite floral upon use, but the smell doesn't linger on the rest of the day; which would definitely be a deal breaker for me when it comes to floral (and musk) scents. 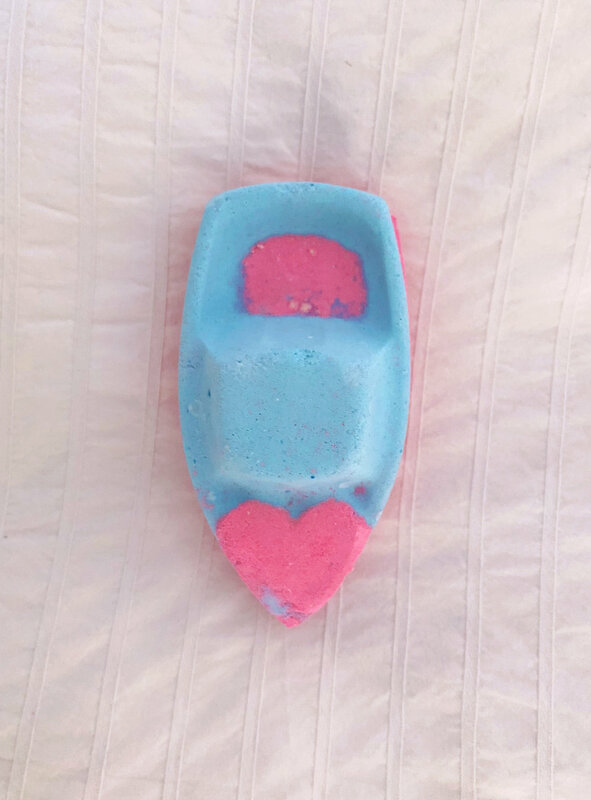 How cute is this bath bomb? 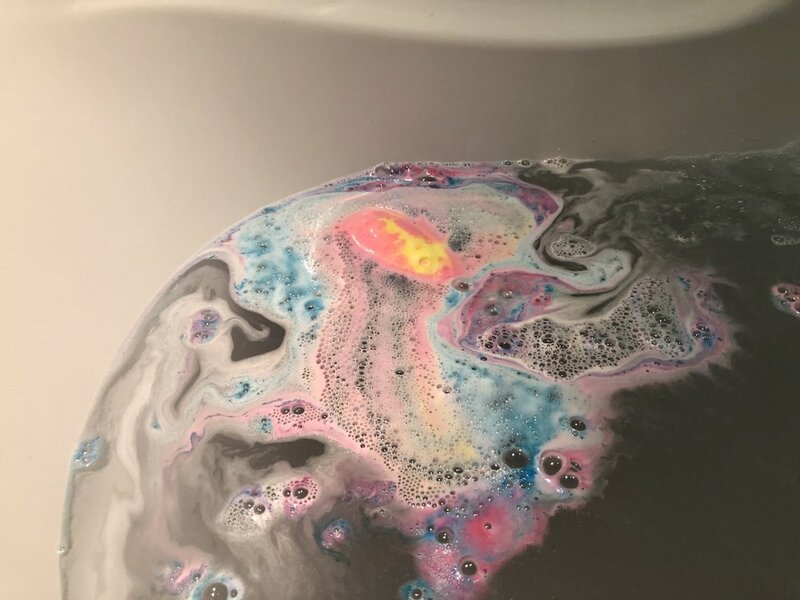 I mean, I love their regular round bath bombs, but this one really hit home. This baby smells pretty sweet but really refreshing at the same time. see those little hearts? those will be floating around in your bath as soon as the bomb has dissolved. now don't be afraid, the bath will turn a little dark halfway the dissolvement, but it'll end up looking like a dark-turquoise glitter heaven at the end. With tiny red hearts flowing around your bum. This little fella may look cute, but he's in for a little tough love! This big chunk of slightly chocolatey, slightly cherry-scented cacoa butter is packed with a fair amount of sea salt and cacao chunks. These two form a perfect team to scrub that dull old skin away. If you're not into intense scrubbing or have a really sensitive skin, this bad boy isn't for you. Okay, feel free to let your "Ahwww's" out. This wash card is basically a really thin slice of soap, which can be used for up to 3 times (but just 1 use for me, whoops). You can rip up this 'card' in smaller pieces and simply use it under the shower like you'd do with a piece of soap. This little fella has a few different purposes because I know a few people who simply use these cards in their closets so they can carry around their favourite Lush scents in their clothes. Kinda smart if you ask me. This guys smells pretty spicy, with a few floral but yet fresh hints (also I'm the worst at describing scents). But hey, for €2,50, go try it out yourself! Tell me: What's on your Lush wish-list at the moment?